The pizza-loving reptiles are performing far better than expected, toppling “Guardians of the Galaxy” from the top spot. Launching a new bigscreen franchise, Paramount and Nickelodeon Movies’ Teenage Mutant Ninja Turtles amassed $25.6 million at the Friday box office for a projected $62 million to $65 million weekend, becoming the second August tentpole after Guardians of the Galaxy to wildly overperform and rescue the ailing box office. The family friendly film, earning a B CinemaScore, will easily best holdover Guardians to claim the No. 1 spot in North American. Guardians is certainly no slouch. The Marvel Studios and Disney tentpole grossed $12.4 million Friday for a projected $42 million weekend to come in No. 2, and pushing its domestic total to $175 million by Sunday (it’s expected to only decline 55 percent). Guardians and TMNT are shoring up the otherwise troubled summer box office, where revenue was down by a steep 20 percent two weeks ago. Revenue is still down by 17 percent, but the gap has narrowed. Guardians is followed by new entires Into the Storm and adult dramedy The Hundred-Foot Journey, which should open to an estimated $18 million and $10 million after grossing $6.5 million and $3.4 million, respectively, on Friday. Step Up All In is headed for a dismal debut in the $6.8 million range, a franchise low. Males are fueling the film (61 percent), while 45 percent of Friday’s audience was under the age of 25. TMNT is opening day-and-date in 17 international markets, and earned $12 million on Thursday and Friday. Russia leads the way with a two-day total of $5.5 million, followed by Mexico ($5.5 million). Directed by Jonathan Liebesman, TMNT stars Megan Fox, Will Arnett, William Fichtner, Danny Woodburn, Abby Elliott, Noel Fisher, Jeremy Howard, Pete Ploszek, Alan Ritchson and Minae Noji. 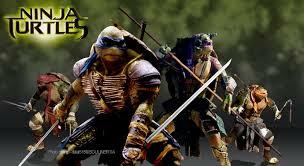 It’s based on the characters created by Peter Laird and Kevin Eastman. In the film, four outcast brothers rise from the sewer and discovery their destiny as Teenage Mutant Ninja Turtles while working with a fearless reporter (Fox) to save New York City from Shredder and his evil Foot Clan. The weekend’s other new action offering, New Line and Warner Bros.’ tornado film Into the Storm, likewise earned a B CinemaScore. Directed by Steven Quale, the movie opens nearly 20 years after Twister turned into a box-office hit. (That film was also from Warner Bros.) Lacking any big stars but boasting plenty of tornadoes, Into the Storm cost under $50 million to make. Going after adults is DreamWorks and Participant Media’s dramedy The Hundred-Foot Journey, about dueling French and Indian chefs owning restaurants across the street from each other in a small French town. The $22 million film, based on the book by Richard C. Morais, has plenty of pedigree behind and in front of the camera, with Lasse Hallstrom directing and Helen Mirren starring. The cast also includes Om Puri, Manish Dayal and Charlotte Le Bon. Hundred-Foot Journey hopes to whip up the same interest shown for Jon Favreau’s indie comedy Chef this summer. The $22 million movie has received middling reviews, but has a potent marketing ally in producers Oprah Winfrey and Steven Spielberg. It also earned an A CinemaScore. Step Up All In, placing No. 6, hopes to make up ground overseas, where it has already earned nearly $30 million. Trish Sie directed Step Up All In, which stars Ryan Guzman, Briana Evigan, Stephen “tWitch” Boss, Misha Gabriel, Izabella Miko, Alyson Stoner and Adam Sevani. At the specialty box office, CBS Films’ romantic comedy What if, starring Daniel Radcliffe and Zoe Kazan, is opening in 20 theaters in 10 markets. The film is opening in the range of Promised Land and The Young Victoria in terms of location average.